The days when you could simply offer a credit card payment option on your website are fast disappearing. Most online customers now expect to be able to choose from a range of e-commerce payment methods. So which payment methods are right for your e-commerce site, and what payment gateways will you need to support them? 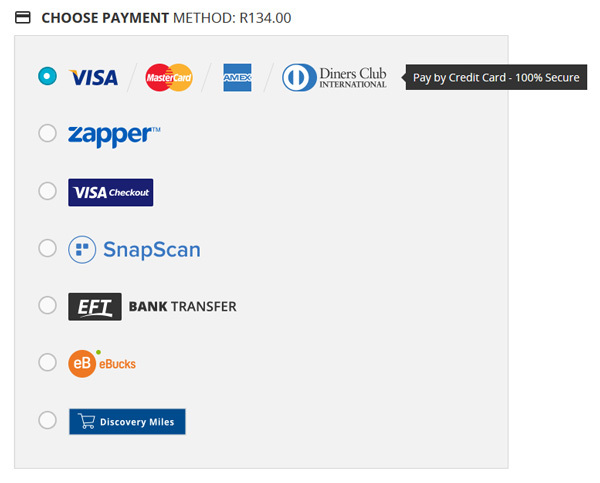 What e-commerce payment methods are South Africans currently using? Although the statistics vary, at first glance it appears that South Africans still favour paying via credit card. Statista (see the graph below) says the current figure for credit card e-commerce payments is 45%. This is followed by Debit Cards and Instant EFT at 20%. 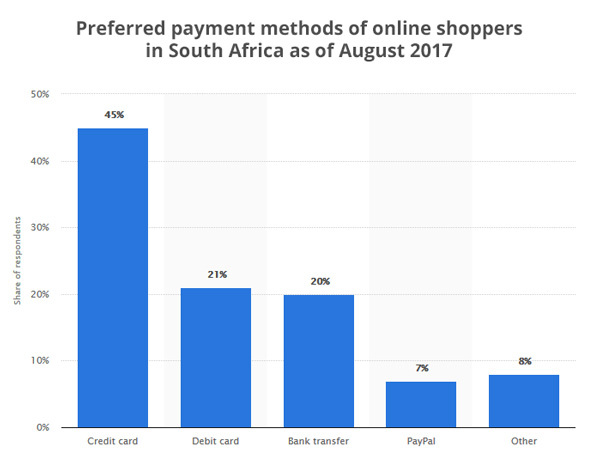 As many e-commerce sites still only offer a credit card payment option though, these figures aren’t necessarily a true reflection of what South African customers would like. Given a choice and some education on the subject, they may well prefer other safer and more convenient methods. So rather than simply going with what’s worked in the past, it’s worth considering what other options could work for your e-commerce business. What factors influence the choice of e-commerce payment methods? There are several factors you need to take into account when deciding what e-commerce payment methods to offer. Let’s take a look at some of those. Where they live – internationally or locally: For example, South Africans tend to be security conscious and risk averse, so safe, alternative options like using QR codes may appeal. How they use their devices and their level of connection to the internet: For example, some people are connected all day while they are out and about. They are attracted to convenient e-commerce options they can take advantage of from their mobile, wherever they happen to be. Their access to bank accounts, and credit and debit cards: For example, in Africa, many individuals and small businesses don’t have credit or debit cards. They may prefer to pay in cash or do online payments using Airbucks from their connected smart phones. Their lifestyle: For example, Millenials are very internet-savvy and open to alternatives. They especially like a transaction method to be quick, safe and easy, so they can get on with their lives. If it’s innovative, like the e-wallet, even better. A once-off payment: This applies to products and services that are purchased only when they are needed e.g. a new music system or the re-upholstering of a piece of furniture. For these, the more secure options you provide the better, for example, Instant EFT, credit card, e-wallet, etc. Your customer should easily be able to find their preferred payment method and complete the transaction. Recurring payments: This applies to products that are purchased regularly, for example, a weekly box of organic vegetables, or services that are ongoing, such as subscriptions or rentals. For these, it’s best to provide additional options that are less vulnerable to things going wrong, like identity fraud or a credit card reaching its expiry date, for example. Methods such as direct debit payments also reduce the chances of customers opting out of contracts and simply not paying. Credit card: This should still be your first choice as credit cards are so widely accepted. They provide credit and also allow for both local and international payments. Debit card: These require the customer to have money in the bank but are available to many who wouldn’t qualify for credit cards, especially in South Africa. Manual EFT: A traditional online bank transfer works well but takes a while to reach the merchant’s account. Instant EFT: This is instantly verified, speeding up the process immensely. It is worth finding out more about this from the Payment Gateways as there are support for manual EFT, instant EFT and Secure Instant Payment (SID). PayPal: This operates independently from a normal bank account and allows for the payment, receipt and transfer of money internationally, although not in Rands. Fairly new in South Africa, it is only available via FNB. MasterPass: This MasterCard product allows customers to quickly and easily check out without having to enter their credit or debit card details each time. Visa Checkout: This is the Visa-backed version of Masterpass. Google Wallet: A similar solution from Google. VC Pay: Also backed by MasterCard, this is a virtual card that needs to be preloaded but can be used just like a credit card on checkout, even in South Africa. QR Codes: This secure and instant payment method, offered by providers like Zapper or Snapscan, works very well on mobile or desktop. A QR code is generated for the total amount and specific transaction. When you click pay – you are transferred to your Zapper / Snapscan app which pays the generated QR code automatically. No scanning, no re-entering of data. Masterpass: Already mentioned above as an e-wallet option, Masterpass works very well for mobile shopping as you just click ‘buy now’ and masterpass does the rest, using your stored details. Cash payments (mostly using a product called Scode): These are especially useful for customers without access to other online payment methods. A unique barcode is generated, which the customer then prints (or keep on mobile screen) and takes to a retail outlet like Checkers or the SA Post Office to make the payment. Lay bys are also possible via this system. Cash on delivery: Here the customer pays exact cash to the driver who delivers their goods. There is little risk of online payment fraud but there are other risks, such as the driver carrying large amounts of cash or the customer simply not being available to pay. This method depends on your own internal processes – and does not go via a Payment Gateway. Mobicred: This is the online version of a retail store credit account. Bitcoin: Bitcoin is a digital and global currency. It allows transactions to be performed without any middlemen or banks. An app facilitates an instantly-verified payment from a bitcoin wallet. Loyalty and rewards programmes: Customers pay using eBucks or Discovery Points they have accumulated. Airbucks (from Airbuy): Also very new in South Africa, digital tokens are pre-loaded and used to make e-commerce payments, or transferred to other users. Need to watch and see if this becomes mainstream. How many e-commerce payment methods are ideal? It’s best to offer several payment options to make sure you cover your e-commerce customers’ needs. If they can’t see an option that works for them, you may lose the sale. On the other hand, if the process of checking out becomes too overwhelming or confusing, you again run the risk of abandoned carts. Takealot has a broad consumer market and is probably a good example of a site that covers the needs of most online customers in South Africa. At first sight, they keep it simple and provide 6 payment options. Then once the customer selects an option, the screen expands to show you other options, if there are any. 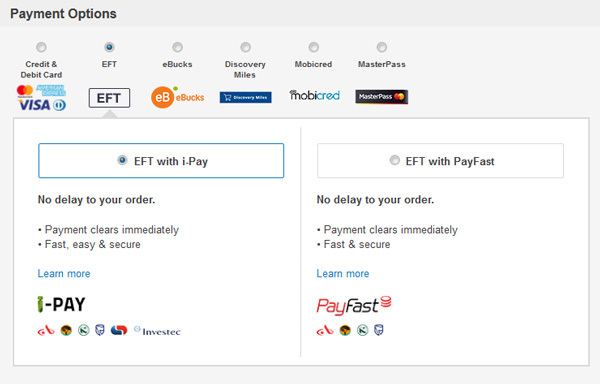 For example, for the EFT option you can then choose between i-Pay and PayFast. You’ll also notice that every option gives you the opportunity to find out more information about it, putting the customer’s mind at ease. This payment process boosts conversion rates because it’s seamless, creates trust and educates the customer, so they always know exactly what they need to do next. Yuppiechef provides 7 options right up front. Their screen is even cleaner though, as they only display the brand/logo of each choice. 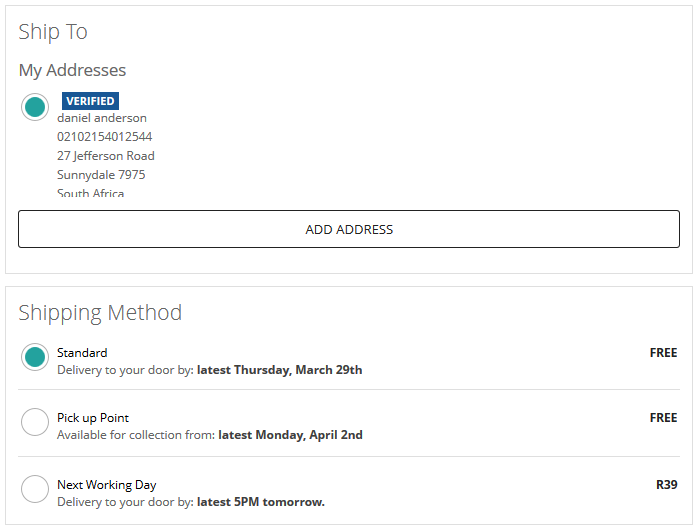 Once the customer makes a selection, more information about only that option appears in the black box on the right of the screen. Notice that by including two QR code options, Zapper and Snapscan, and an e-wallet, Visa Checkout, they are catering for customers who prefer to protect their card details when shopping online, as well as on the go customers. 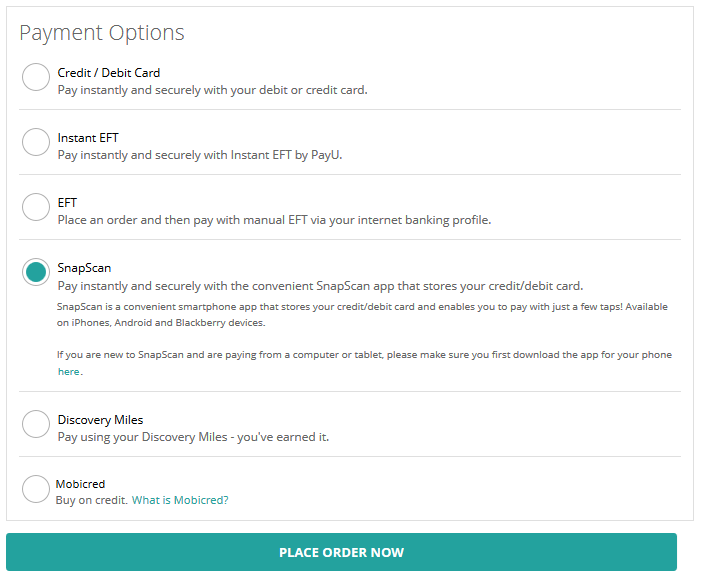 Spree offers 6 options, including both instant and a manual EFT, as well as Snapscan, for those who prefer not to enter their card details, and Mobicred – for those that may be cash strapped. Each option displays a short description next to it. Then, like Takealot, when the customer selects one, more information is provided. This includes tips on what to do next, subtly encouraging the customer to take action. Clear and simple explanations about what the payment method is and how it works. Which e-commerce payment gateways are available in South Africa? At the moment, customers are not really interested in the payment gateway itself, but that may change as they become more savvy. If so, it would be useful to include that information on your e-commerce site in the future. For now, it’s important for you to understand what e-commerce payment gateways you need to support the payment methods you are offering and analyse the cost to your business based on their fees. 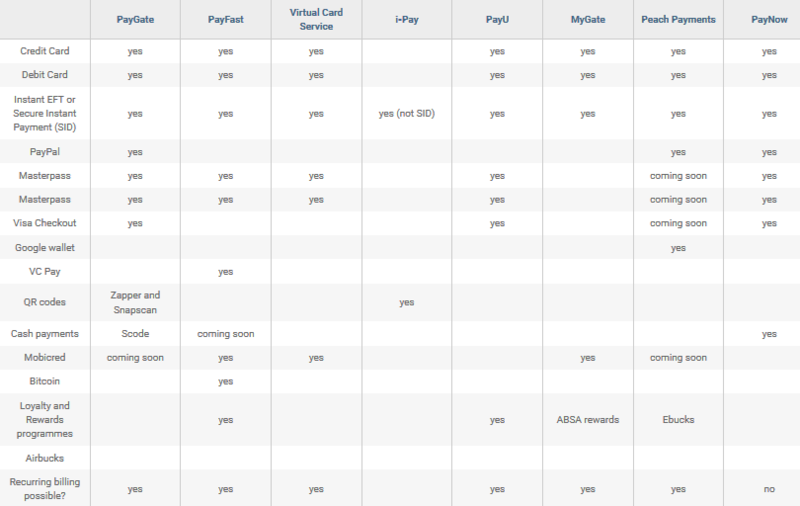 Below, we provide an overview of payment options offered by the most prominent Payment Gateways in South Africa. In a next blog, we will discuss their full set of fees in detail. Check that your website development company can add your chosen payment gateway to your site. If you are trading broader than South Africa it is worth understanding currency impact from both your payment gateway and your website software. We have tried to be as accurate as possible and asked the Payment Gateways to verify the information – but this industry moves fast and information changes very regularly. You can also directly link your site to PayPal, Zapper or Snapscan – they are not included in the table as they offer a limited range of options. But it may make sense for your business to add them separately. Contact us to find out more about integrating your e-commerce site with these and many international gateways. Although there are numerous e-commerce payment methods out there, some will work better for you than others. The key is to know your customers and your business, and to tailor your choices accordingly. The right options, well displayed and explained, will gently ease your customers to conversion, boosting your sales along the way. What e-commerce payment methods do you prefer to use when shopping online? Share your thoughts and experiences in the comments below.